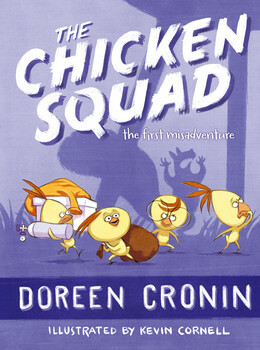 Sorry, sorry… It’s called The Chicken Squad, a series of light-hearted mystery stories written by Doreen Cronin and illustrated by Kevin Cornell. “Meet the Chicken Squad: Dirt, Sugar, Poppy, and Sweetie. These chicks are not your typical barnyard puffs of fluff, and they are not about to spend their days pecking chicken feed and chasing bugs. 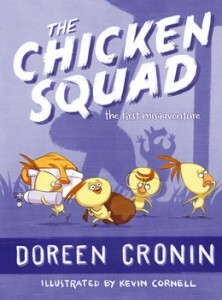 No sir, they’re too busy solving mysteries and fighting crime.” In The Chicken Squad: The First Misadventure, “… when Squirrel comes barreling into the chicken coop, the chicks know they’re about to get a case. But with his poor knowledge of shapes (‘Big’ is not a shape, Squirrel!) and utter fear of whatever it is that’s out there, the panicky Squirrel is NO HELP. Good thing these chicks are professionals”. Following all this? Check out this new book series from Atheneum Books for Young Readers over at Amazon, in one of several formats.